The Fellowship was fortunate enough to obtain a copy of ALIENS VAMPIRELLA #1 from Dynamite Entertainment. Corinna Bechko writes, Javier Garcia-Miranda draws and InLight Studios colors. The good folks of the first Mars colony have made an interesting discovery: they have found evidence of civilization under the surface. Much of what’s there appears to be built by nosferatu, so they call in the one and only Vampirella to check it out. As she starts to make progress on translating some writings they found, a wall of ice collapses revealing an egg chamber. Soon there are face huggers all around, and things can only get worse from there. These are two properties that just fit together beautifully. This story captures the feel of the first Alien movie really well, too, which is a big plus for me (I love me some Aliens, don’t get me wrong – but Alien was a horror story). And just like that movie, this book builds the characters, which gives the readers a feeling of investment (the thing that most bad horror doesn’t do). The art contributes a ton to that Alien feel, too, building a sense of claustrophobia along the way. This is one seriously cool crossover (pun somewhat intended), and it’s a well-crafted story too. You’ll want to check this one out. 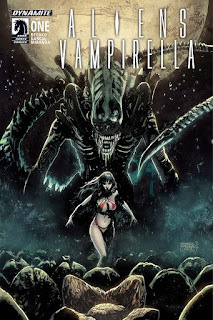 ALIENS VAMPIRELLA #1 is available now at your FLCS or at dynamite.com.